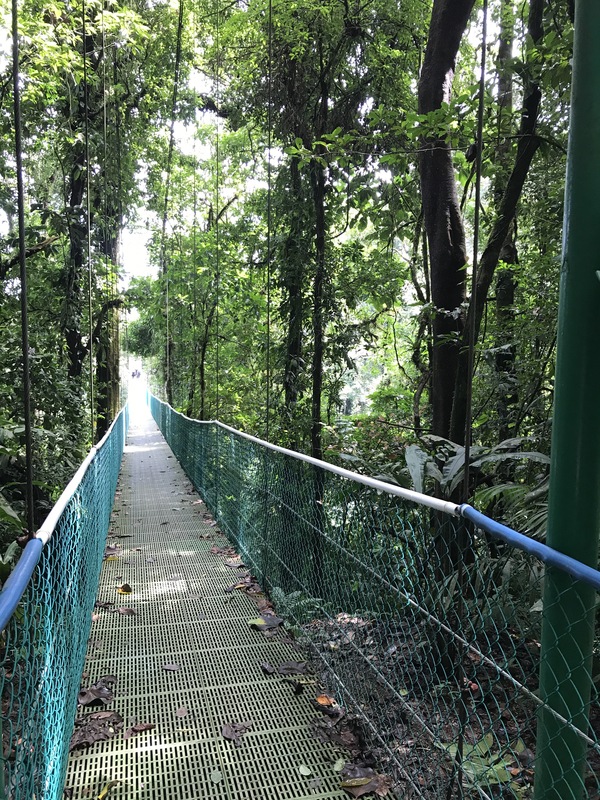 Hiking, or at least walking, in the rainforest was a daily activity during our stay at the Arenal Volcano in Costa Rica. Some guided, some self paced, our walks took us through areas teeming with wildlife. We went out every morning, so we could avoid the heaviest rain in the afternoon. Though we found animals throughout the day, the best viewing was early morning and at dusk. 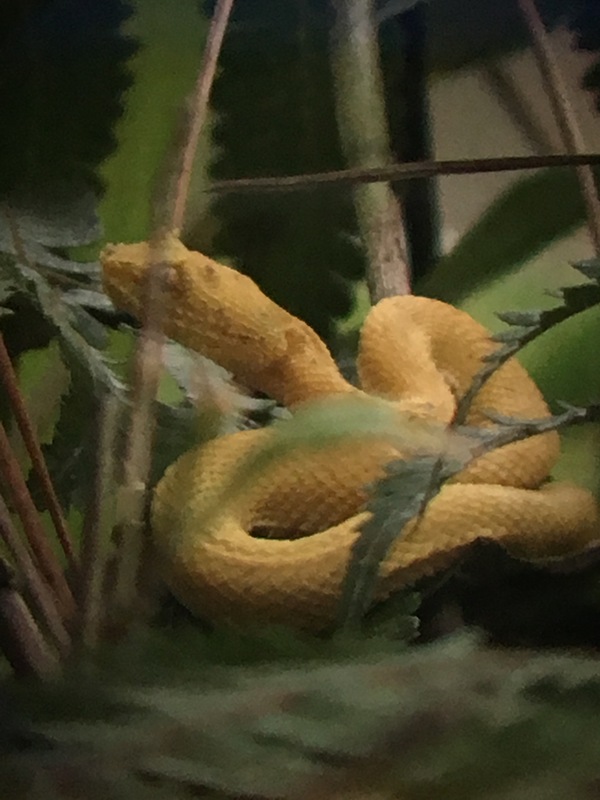 We spotted howler monkeys, spider monkeys, toucans, coati, lots of butterflies and birds, dozens of eyelash pit vipers and even a boa constrictor that was over 4 ft long. We tried a variety of terrain. One evening we took a 2 hour night hike on the lava trail. The 1968 lava fields were one of the more challenging hikes, gaining a great deal of altitude in a short period of time, the views from the summit however were impressive, and the trail took you right over one of the towns that was buried in the eruption. 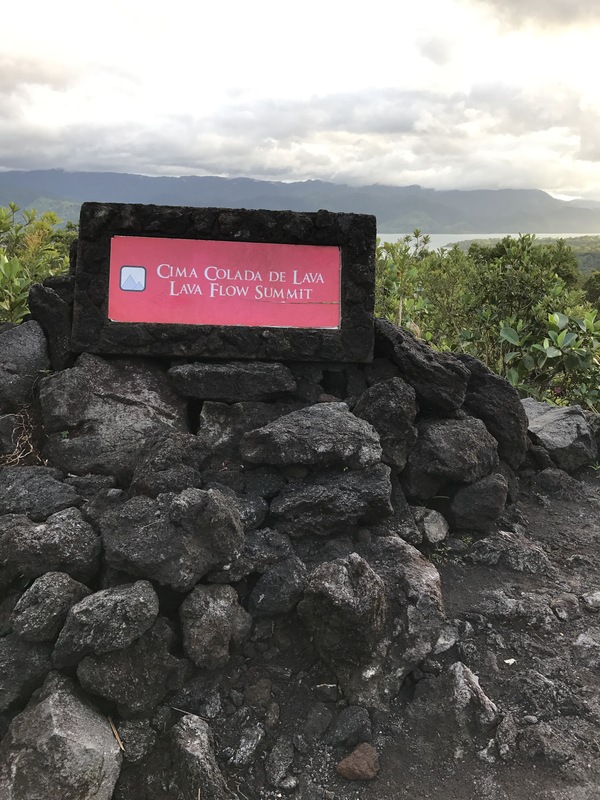 There was a path marked “evacuation route, but as the guide noted, if lava began spilling, we would only have 3 minutes or so to escape, and it took us much longer to hike the trail. 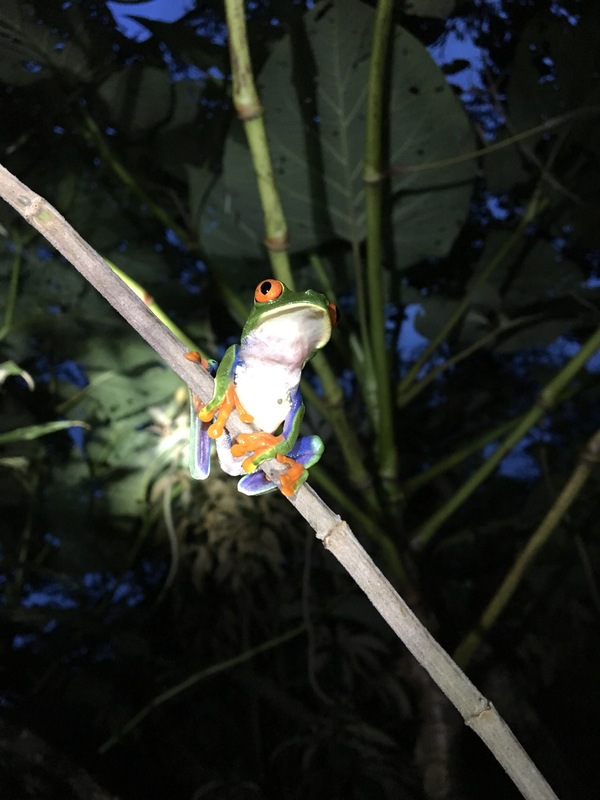 At the end of our lava hike, the sun was setting, so we paused to observe the pond, home to a variety of tree frogs, we spotted 3 different species in the time we were there. 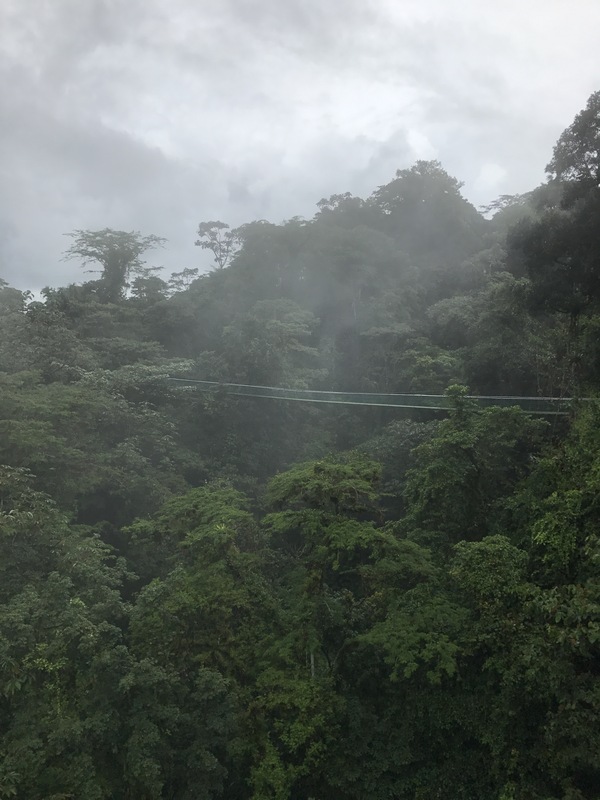 Next morning, we tried the Sky Walk, a guided hike across hanging bridges through the tree canopy and then down to a series of waterfalls. Again, wildlife was numerous. The 3 hour hike was less strenuous than the lava trail, following a cleared path, with bridges. The effort was moderate as we gained and lost altitude a number of times although the trail was rocky and slippery in places, especially near the waterfalls. 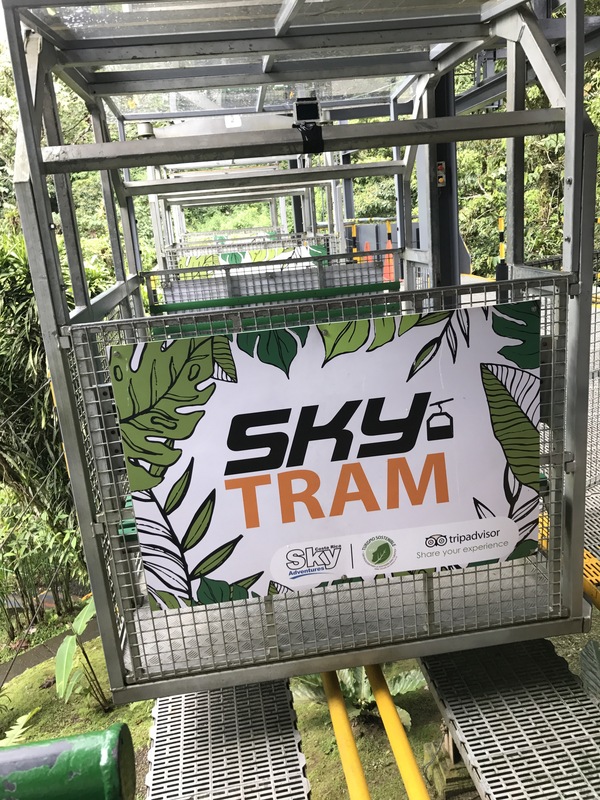 After our hike we took the Sky Tram to the top of the hill, watching braver tourists return on zip lines, as we took the easy way down on the tram car. 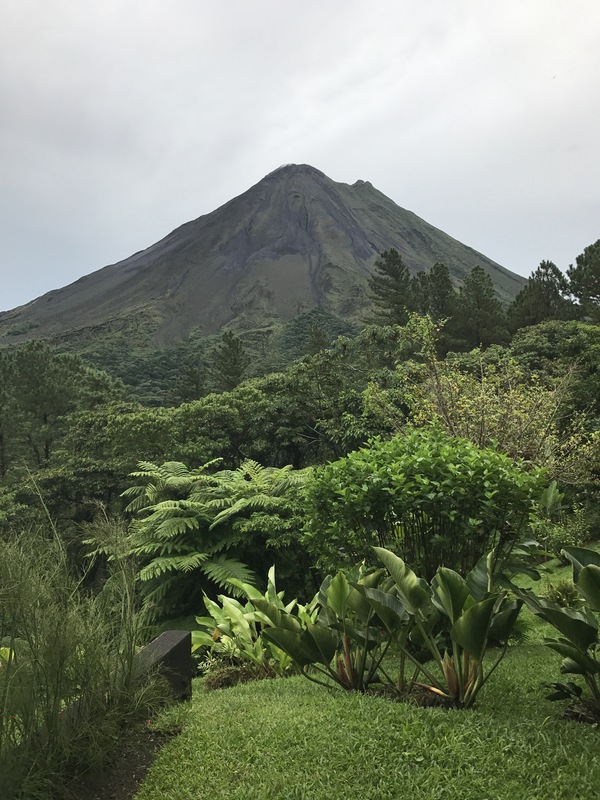 Our hotel, the Arenal Observatory lodge, had more than 7 miles of trails on the hotel property. Most ranged from two to five km. Several were paved and accessible to all visitors, but there were other more challenging trails with rock climbing and altitude changes. 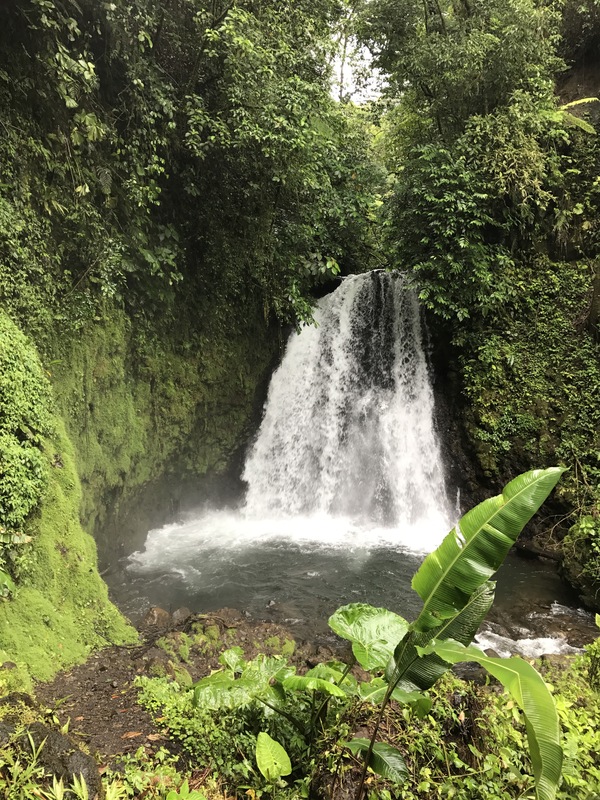 We enjoyed a guided waterfall hike, where we saw more monkeys and snakes, but Boy’s favorite walk was the one to the hotel frog pond. 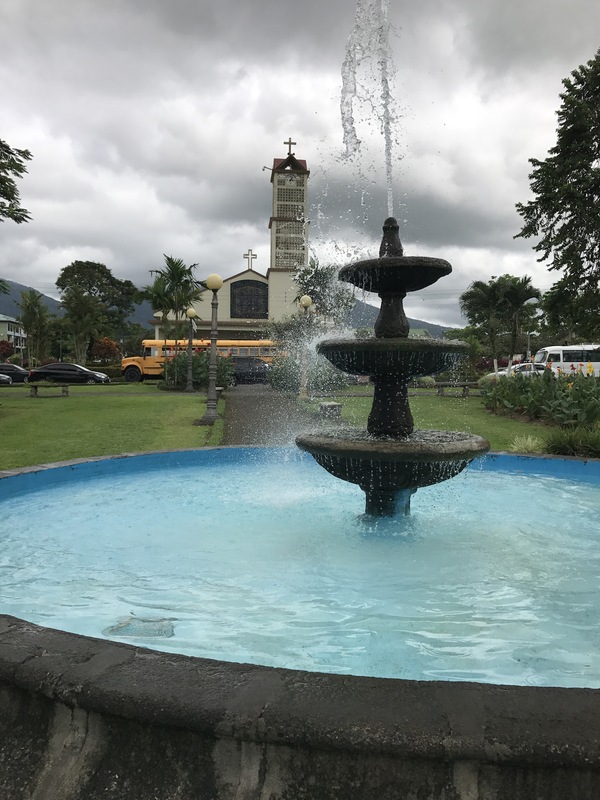 Sitting at the base of the Arenal volcano, the town of La Fortuna overlooks a pleasant plaza with a garden of tropical flowers. At the far end of the plaza, the church, a recent construction completed after the 1968 eruption, dominates the town center, throwing shadows on the central fountain. Surrounding the plaza are a variety of cafes, souvenir shops and convenience stores to serve the tourists and backpackers staying in the many hotels and hostels a bit further out from the center of town. It is Grandma’s birthday, and Boy had written a postcard, so our first stop in town was the post office to buy stamps. We practiced a bit while we stood in line, but Boy was quite pleased to ask the lady at the post office in Spanish for “2 international stamps, please,” and then to pay, all by himself. We dropped the postcard in the mail before we left the office. Next it was off to find a bank. The first ATM we found was local only and not linked into the international ATM system, but a few blocks further, the second bank had an international ATM able to give withdrawals in either Costa Rican Colones or US Dollars. This was a difficult choice for us, as we generally prefer local currency and used Colones in San Jose. 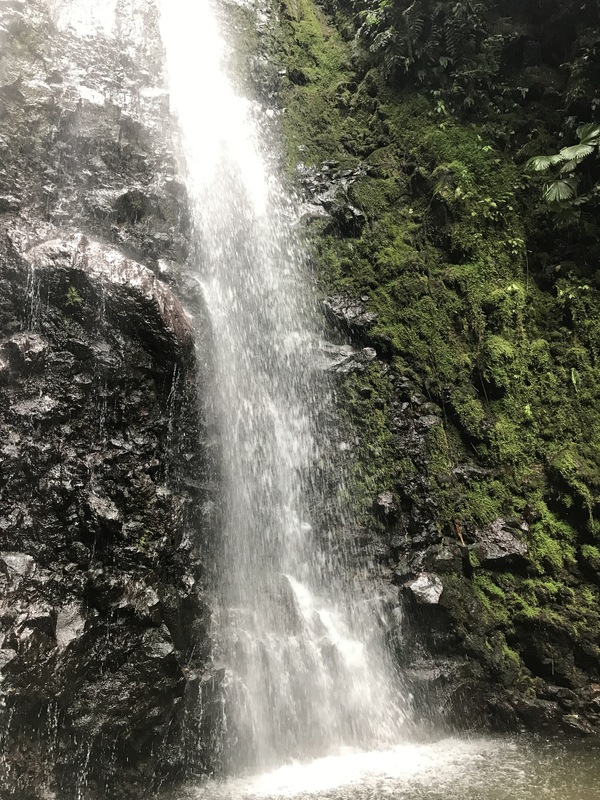 However, most places in La Fortuna cater to tourists and accepted both currencies. Some businesses, like the taxis, even preferred US dollars in payment. We split the difference and withdrew some of each. We enjoyed a break at a coffee shop, before peeking in the church. Boy added another keychain to his backpack. With one from each country we visit, you can now hear the jingling as he walks. As it sits so close to the volcano, the town is surrounded by a number of Aguas Termales, or hot springs. 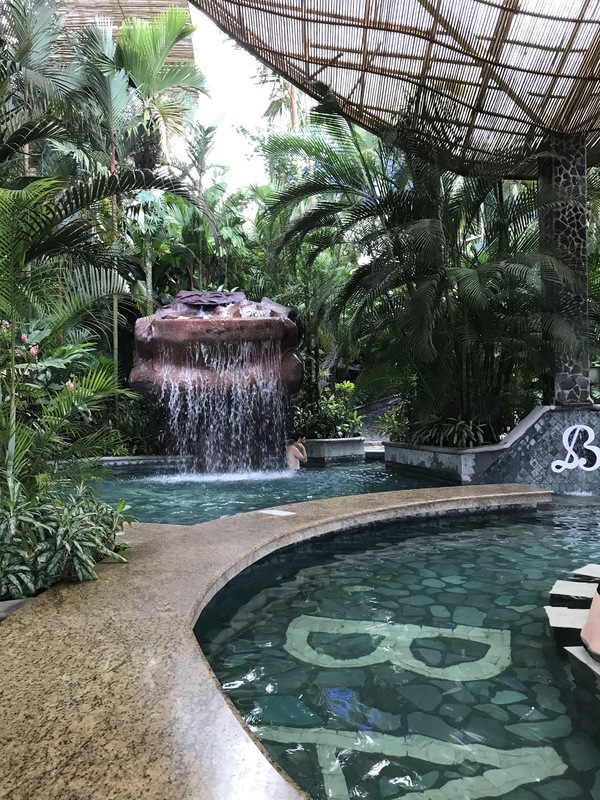 We have enjoyed hot springs in the US, New Zealand, and in Argentina, so we were keen to try the ones in Costa Rica. 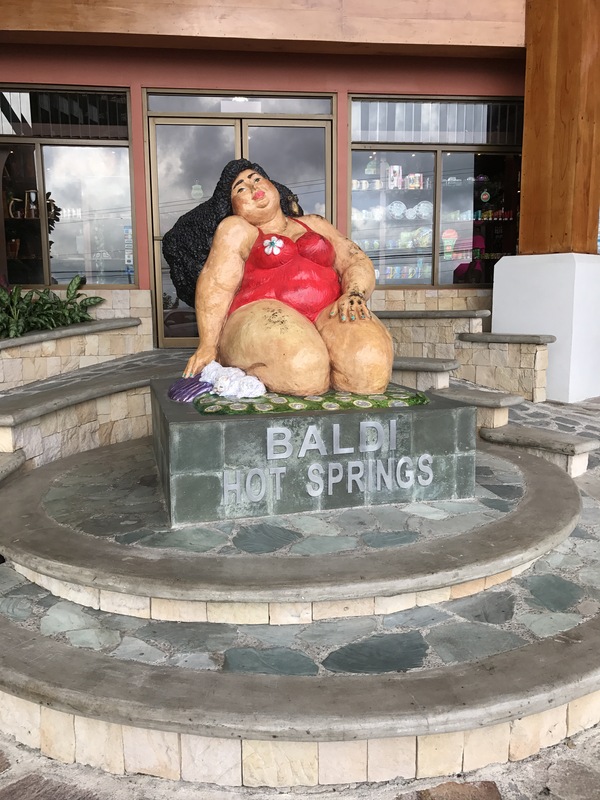 With more than a half dozen to choose from, we decided to skip the most expensive and secluded hot springs, advertising quieter, relaxing spa atmospheres, and instead went for the family friendly Baldi Hot Springs. In addition to 25 pools of varying temperature, Baldi had a kids water playground and 4 warm water, water slides. We spent an entire day trying out the pools. Boy’s favorite was the Roman Baths, while Dad preferred the swim up sports bar. Generally, we have had good luck with our world travels, though there have been some hiccups along the way. We didn’t expect anything out of the ordinary on our flight to San Jose, Costa Rica. Heavy thunderstorms were bearing down on the Dallas – Fort Worth airport as we arrived, so we were mentally ready for a flight delay. A minor mechanical issue, delayed catering, and the thunderstorms did mean we spent an hour or so on the runway before taking off. The flight itself was uneventful, but on arrival, we had a go around, when the runway was not empty when our pilot made his approach. The prior flight had not yet exited the runway, so we got a second tour of San Jose by air before safely landing and pulling up to the gate. We were not able to deplane immediately, as there was a short delay before the jet bridge could be extended. We soon found out why. There was a power outage at the San Jose airport. Locals reported this is a somewhat frequent occurrence. We got off the plane and headed to immigration where we found that the power outage had caused a problem with the immigration system computers and they were not able to reboot the system. All immigration was stopped, and several planeloads of people were in the queue, zigzagging through the line markers like an amusement park line. We managed to make it to the end of the queue, but most of our plane and those who arrived after us snaked down the hallways outside the immigration hall. It was an hour and 15 minutes before the computer system came online and the agents began processing arriving passengers again. Customer service staff at the airport handed out water bottles and turned on fans to cool the crowd, doing their best to keep the chaos to a minimum, but it was a long hot wait. With no phones or electronics allowed in the immigration hall, Boy was restless. I challenged him to count the seconds, telling him if he got to 5000 I would give him a dollar. He got the dollar, and I thought I might have to pay up twice. Once processing started up again, the line moved rather quickly, but it was still nearly 3 hours, in all, before we got to baggage claim and were able to leave the airport. That was one of the longest immigrations we have had, yet. As every plane had been delayed, the arrival hall was busier than usual, with car drivers, tour operators, and relatives trying to collect 5 or 6 plane loads of arriving passengers. Leaving the chaos of the arrival hall, we arranged a taxi and set off to our hotel. 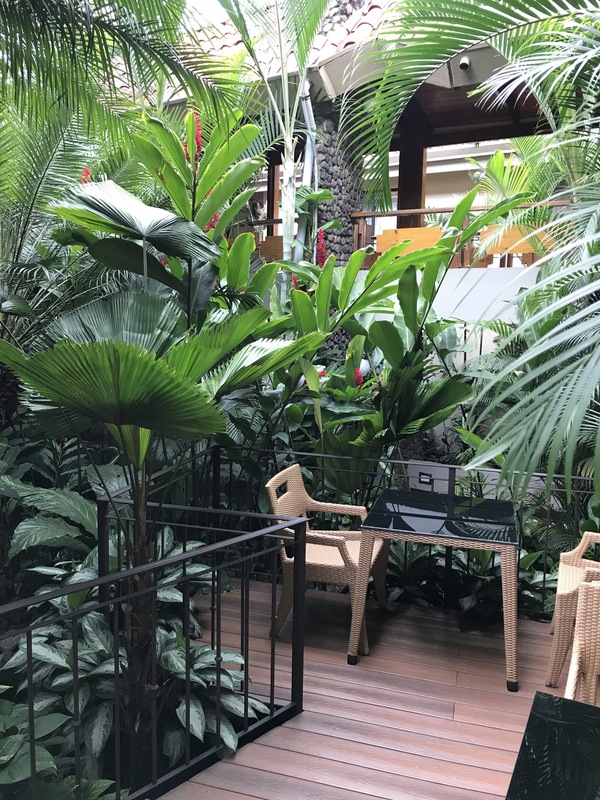 We had decided to stay at an airport hotel, for convenience, while we were in San Jose, as our main stay in Costa Rica would be in the rainforest. We had planned to spend our arriving afternoon in the city of San Jose, visiting the Plaza Central and Museo del Oro, but by the time we left the airport, the museum was closed. 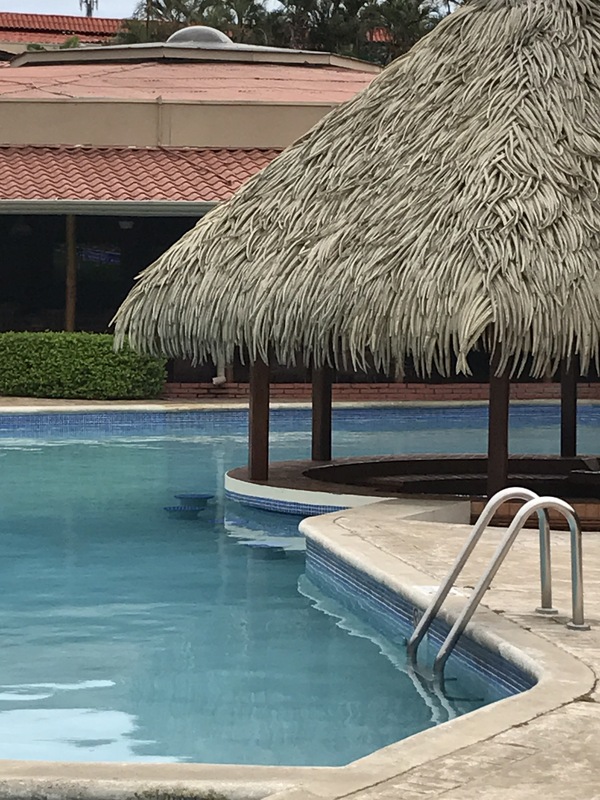 Instead, after a quick stop at a local grocery for supplies we went to the hotel swimming pool. San Jose city center would have to wait for another day. 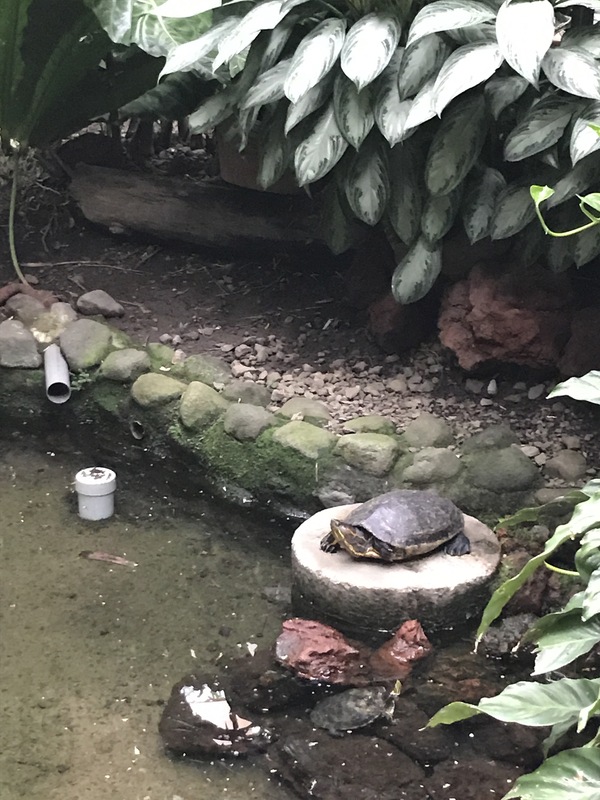 The hotel did have an indoor garden and turtle pond which entertained Boy for the evening. It also has internet, so he was thrilled. On our return to San Jose, before leaving the country, we were finally able to make it to the city center. It was raining, again, so we stepped into a busy, local cafe for lunch, that was packed with office workers. Scanning the menu, we chose Tico (Costa Rican) specialties of arroz con pollo, plantains and empanadas. As the rain slowed we saw the National Theatre, and then headed underground to the Museos Banco Central de Costa Rica, the museums of the national bank. This inverted pyramid is one of the only underground buildings in Costa Rica. These bank vaults are home to the Museo del Oro, which has an outstanding collection of precolumbian gold and archeology and the Numismatic (money) museum. The Numismatic museum presented a display of the history of Costa Rican money and a surprisingly good interactive exhibit on personal finance and money management in both Spanish and English that kept Boy interested through a lengthy discussion of investing, saving and budgeting. Brains engaged it was back in a taxi and out of the rain to our hotel. We wound upwards for three hours from San Jose, Costa Rica. 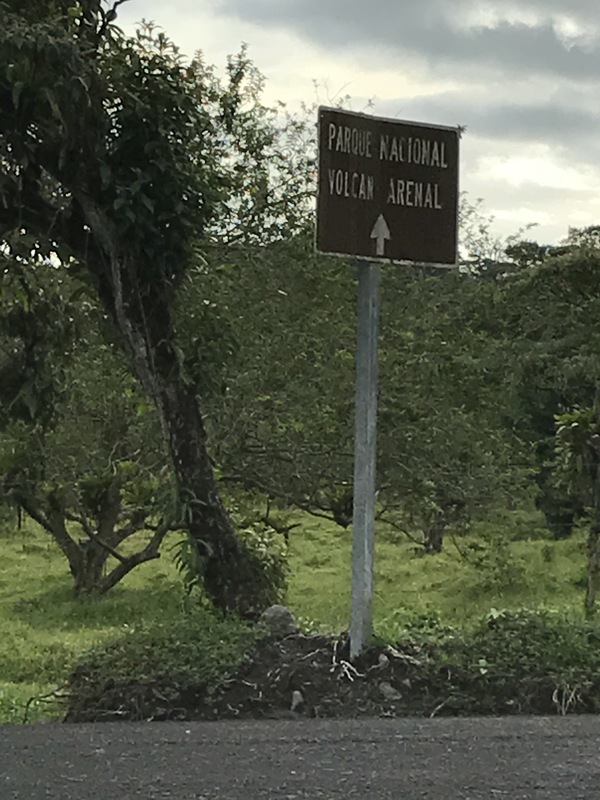 Passing an industrial area near the airport, then strings of furniture stores, villages, fruit sellers, and finally long stretches of twisty mountain roads through lush green forest, we reached the Parque Nacional Volcan Arenal. An unexpectedly clear day gave us unparalleled views of the volcano. Surprising local villagers, the volcano woke up in 1968 with a great explosion and was active continuously through 2010. Now quiet, the rainforest has again begun to overtake the slopes of the volcano and the wildlife is numerous. 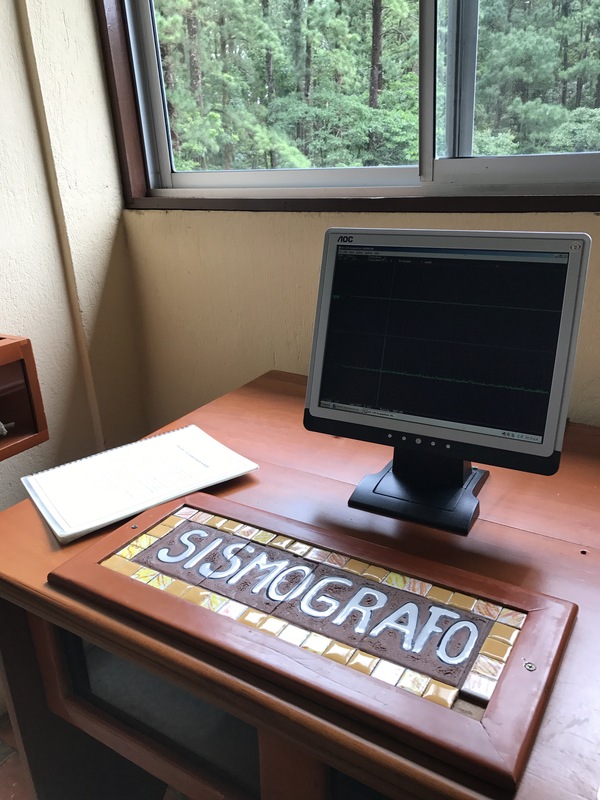 Recovering from our drive, We started our day at the museum and seismograph at the Smithsonian Volcano Observatory on the grounds of the Arenal Observatory Lodge. 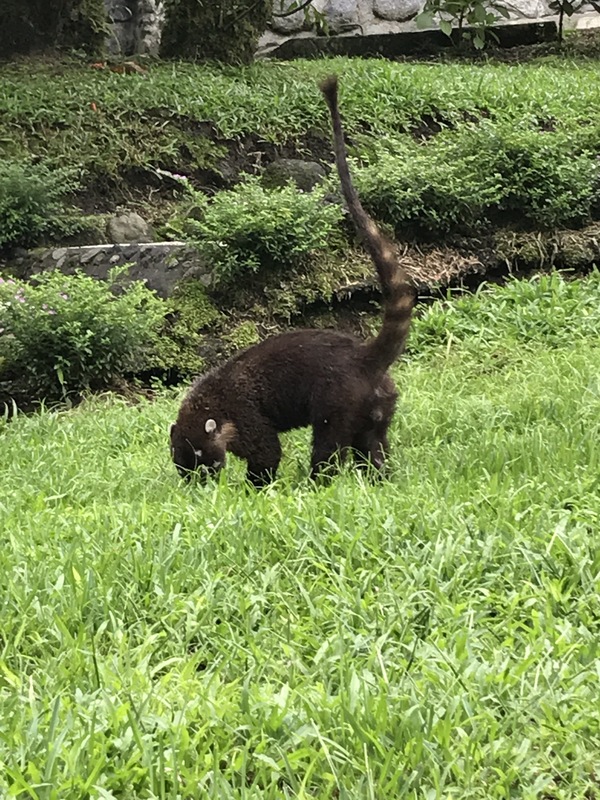 Boy photographed the local wildlife, taking hundreds of shots of a coati, digging for dinner outside the museum. He was less impressed with the seismograph and small museum when he realized the volcano we could see out the window was not extinct, but merely dormant and had been active within his lifetime. To calm his anxiety, we tried to remind him of past volcanoes we have visited without incident in Hawaii, New Zealand and Ecuador that were far more active than this, but the efforts were wasted. Recalling our stay on Santorini, where the entire island is a volcano, He is now convinced we have recklessly taken him to multiple places where he was in imminent danger of a volcanic eruption. He quoted stats from our Pompei visit to back up his claims, noting that risks from lava were irrelevant, as the fumes and ash would kill us in minutes, assuming the big rocks didn’t smash us first. Further research led him to realize Yellowstone National Park in the USA is a volcano, with geothermal activity, proving it is not extinct, but merely dormant. He is not happy with us, and says he would prefer to be in Australia, as he has a better chance there of avoiding deadly snakes and spiders than he does an eruption. At least he has been learning something as we travel. We hope the promise of tree frog spotting, later will lift his mood.